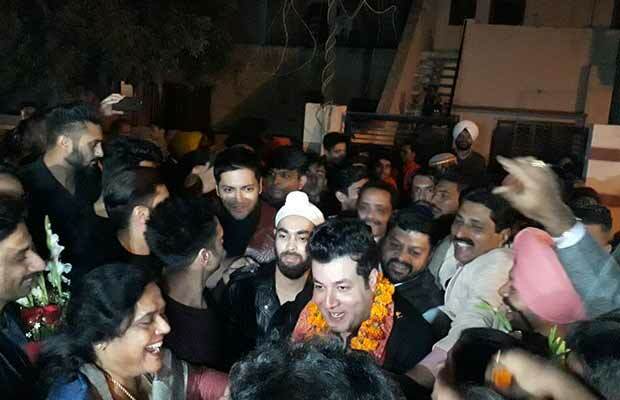 Varun Sharma Aka Choocha Gets A Grand Welcome Back Home In Jalandhar! Home BOLLYWOOD Varun Sharma Aka Choocha Gets A Grand Welcome Back Home In Jalandhar! Choocha aka Varun Sharma from Fukrey Returns recently took his teammates to his hometown Jalandhar just before the release of their film. The Fukra gang had a gala time touring the city and knowing their co-star a little more. It is a lesser known fact that the Fukrey actor Varun Sharma hails from Jalanadhar, Punjab. Varun Sharma along with Pulkit Samrat, Richa Chadha, Manjot Singh, and Ali Fazal toured Jalandhar and visited places where Varun Sharma spent his childhood days being the Fukra that he is. The Fukrey Returns team visited the old house where Varun Sharma spent his childhood. The entire neighborhood got to welcome the homecoming of the actor and greeted the entire star cast with band-baja and garlands. Varun Sharma, Pulkit Samrat, Richa Chadha, Manjot Singh and Ali Fazal spend a good amount of time in the house which was now host to the entire neighborhood that gathered to get a glimpse of their favorite stars. Varun Sharma’s maasi (maternal aunt) who stays nearby also got to welcome her nephew and treated the entire cast with food and refreshments.